Yesterday was the day I picked for some two wheeled fun. I started off by taking the dog for a run beside my mountain bike - just 3km for her rather than exercise for me. She thought that was fun but perhaps didn't like it when she saw me wheel the Tenere out of the shed. 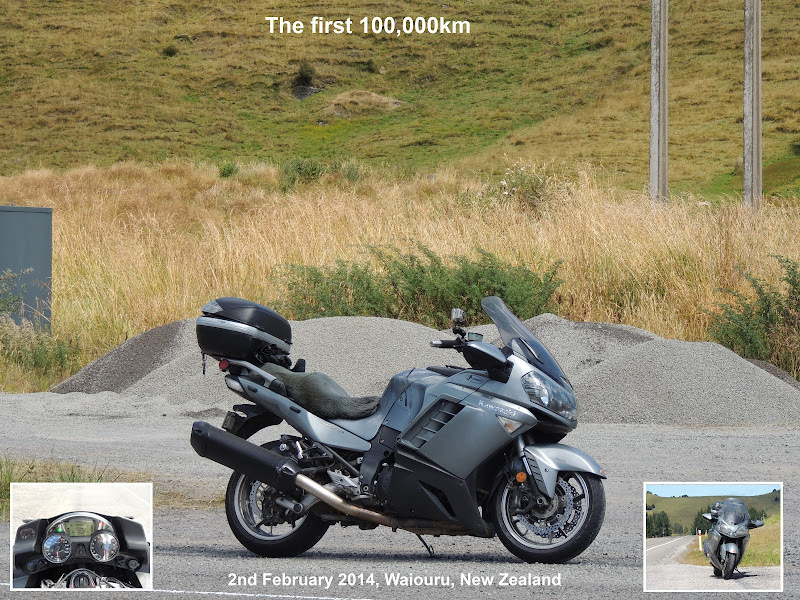 I got away from Palmy just before nine and made my way over to Bulls where I fueled up for the ride. 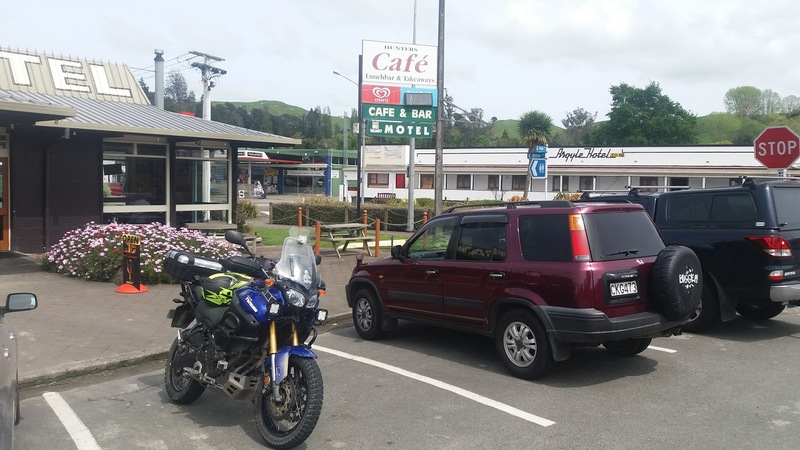 Gassed up, I settled into a slow cruise (4km/h tolerance this weekend) as I made my across to Turakina before turning off to Fordell and then making for the valley. There is quite a bit of tarmac on Mangamahu Road before you hit the gravel but it gets pretty narrow and windy. There were also a few sections of roadworks and places where slips had come down across the road. Not too many animals on the road though - I just missed a rabbit and spotted a few pheasants and one colourful peacock. Hitting the gravel I took my time getting into the groove. The going was definitely better than last time I was up here - much less (none in fact) mud and even my poor worn out E-07's were better than the Tourance I was running back then. Just below the "summit" of the hill I stopped for a breather and to look about a bit. Carrying on, it wasn't long until I ran out of gravel at Kakatahi but before I got there I noticed a little something that I don't believe I'd seen before. Back on the tarmac again I made my way towards Ohakune, avoided being squished by a car towing a caravan, plowed through a mob of sheep and eventually caught up with some light rain...great. Leaving home I'd had no real firm plans but had thought that Ohakune might make a nice lunch stop but looking off in that direction things were looking bleak...So, I decided to cross over to Turakina Valley Road a little earlier by taking in Owhakura Road. Turning South on Turakina Valley Road the gravel was a little loose in places but it was a lot of fun. I particularly enjoy the more open sections where the pace can be a little hotter. By the time I hit tarmac again it wasn't only the riding that was hot, the rider was also feeling fairly warm. So, it was time to switch to motard road on the twisty windy tarseal on the last bits of Turakina Valley Road and Ongo Road, eventually getting me through to Hunterville where it was about quarter past lunchtime and definitely time for a cold drink. Great report Andrew - we live in a stunning country, don't we? Awfully tempted to get a small trail bike for the Coromandel after seeing your adventures! That hole is absolutely fascinating. There's bound to be a reference somewhere so if you ever find out about it, I'd love to know! Yes, I'm gonna do a bit more investigating into that hole (I'll refrain from looking into it), might ask some more Kiwi Adv riders. The best we could come up with was water eroded papa. You got out on pedal powered and the Tenere? Now that is motivation. I always enjoy seeing pics/videos from your neck of the woods. Not much of a pedal but dog enjoyed the run. Thanks, I enjoy posting the pics and videos. Now, on ya bike! Ah mate, you missed motogp and for what? Exploring Hobbit holes. I thought you'd be over those little guys by now. Looks great. You guys have it good down there.